They don’t make films like this any more. Walk Into Paradise claims to be ‘the story of the most primitive people on the face of the earth’. Shot entirely in New Guinea in 1955, barely a decade after WW2, the film was the first of three Australian/French co-productions made by Chips Rafferty and Lee Robinson’s Southern International in conjunction with Edmond Decharme’s Discifilm. Steve McAllister (Rafferty) is an Australian Patrol Officer ordered to lead an expedition up the Sepik River to Paradise Valley into ‘uncontrolled territory’, where Sharkeye Kelly (Reg Lye) has discovered oil. Accompanying them on the expedition is glamorous French United Nations doctor Louise Demarcet (Francoise Christophe), who is reminded by Sharkeye that she’s on the Sepik River not the Riviera. Anxious to reach the highlands before the start of the wet season, McAllister’s initial suspicion of the doctor evaporates when her skills are required to save the children of a tribal leader to avert massacre. Dialogue scenes were shot twice, in English and French and the film was edited in France, where it was released under the title L’Odyssee du Capitaine Steve . 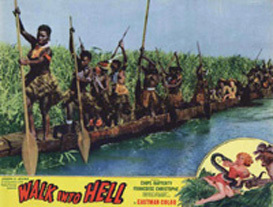 Later sold to the American Joe Levine, who apparently made a motza after he embellished the film with jungle stock footage featuring lions and tigers and renamed it Walk Into Hell. Cinematographer Carl Kayser was highly commended at the 1956 Cannes Film Festival for his brilliant Eastmancolor photography of the magnificently plumed highland warriors. The film has been restored by the National Film and Sound Archive and released on DVD by the Papua New Guinea Association of Australia. The DVD can be purchased at: pngaa.net. Extras include a home movie shot by Rhonda Grogan, who worked as a continuity assistant on the film, as well as a rare interview with director Lee Robinson.